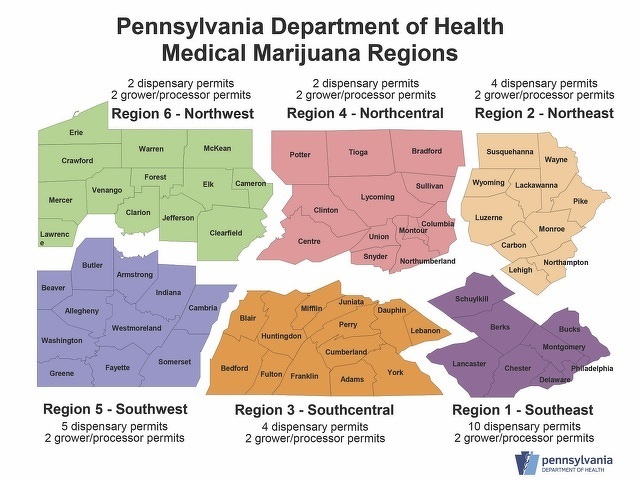 I am writing this on Tuesday, June 20, which is the day that Pennsylvania is awarding 12 grower-processor permits for medical marijuana in the state. That equates to two for each geographic region, including Region 4 - North Central. Region 4 includes Centre, Bradford, Clinton, Columbia, Lycoming, Montour, Northumberland, Potter, Snyder, Tioga and Union counties. In addition, the state Health Department expects to issue dispensary permits by the end of June. Twenty-nine states plus Washington, D.C., have approved medical marijuana as Pennsylvania did last year. Each approved grower in Pennsylvania will be required to begin growing in six months and the growing facilities must exist in warehouses that are fully secure. Marijuana is big business, as economists expect Pennsylvania’s medical marijuana markets to be worth $150 million in the first year. The state has already made money on the applications. Growers had to submit a nonrefundable $10,000 application fee and dispensaries had to pay a nonrefundable $5,000 application fee. Pennsylvania has raked in between $2.5 million to more than $5 million from nearly 500 packages containing applications before any operations are running. On top of these numbers, growers also sent a $200,000 permit fee, which is refundable if the permit is not granted and proof of $2 million in capital. In other words, deep pockets need only apply. Dispensaries also come with a steep price: a $30,000 permit fee, which is refundable if the permit is not approved and proof of $150,000 in capital. The proof of capital is important so the growers and dispensaries can be up and running by 2018. Other than financial resources, no less than 30 criteria were reviewed to select the winners. Criteria are weighted with the largest percentage (20 percent) depending on diversity and community impact. Other benchmarks to be met included good moral character, sanitation, safety and diversion prevention (keeping the marijuana out of the wrong hands). Of course, with medical marijuana approval, the talk of full legalization is in the air. Four states, Colorado, Alaska, Oregon and Washington, have launched recreational pot programs. Four more states, including California, have it in the works. In Colorado, the total sales of recreational and medical marijuana hit $1.3 billion in 2016. That equated to $200 million in tax revenue for the state last year. For a state facing a deficit like Pennsylvania, the tax revenue is attractive. Pennsylvania has a budget shortfall of $1 billion and continuing pension shortfalls. As of 2015, states face a combined pension funding gap of $1 trillion. The tax revenue to each state would most likely not be as large as Colorado just as gambling revenue and taxation were a boon but hurt destination spots like Atlantic City as it spread the wealth to other states. It would also decrease the costs of litigation and arrests for the drug. Arrests for possessing small amounts of the drug exceeded those for all violent crimes in 2015 according to a study by Human Rights Watch. No matter which side you are on in the debate, medical and recreational marijuana are big business but still not federally legal. This causes a problem when dealing with banks and credit card companies. Federal law still labels marijuana a controlled substance and sale or production of the drug is still federally illegal. In turn, banks must disclose any transactions with producers or dispensaries as suspicious activity. Given this scenario, marijuana businesses are known for a large buildup of cash. In June 2016, Travis Mason, a security guard at a dispensary in Colorado, was shot and killed during a robbery. Due to the dangers of holding so much cash and the increasing state legalization, the “Secure and Fair Enforcement Banking Act” (SAFE Banking Act) was introduced in April that would permit banks to work with legal marijuana businesses. Many banks already try to work with the businesses but in a very quiet way. Finally, in an effort to prove that where there is a will there is a way, a credit union named Fourth Corner was set to open in Denver in January 2015 to serve the legal cannabis industry. However, a judge rejected the approval of Fourth Corner saying it “would facilitate criminal activity”. This was a reminder that while states may approve of medical marijuana and other uses, the product is still illegal under federal law. We will see where the businesses go from here, but locally we may be watching from a distance. No grower-processor permits were issued for Centre County. For Region 4, permits in the initial round were awarded to applicants in Clinton and Montour counties. Prior to the start of the 2017 NHL Entry Draft Friday night, the league announced plans to sponsor feasibility studies into potential new Division I college hockey programs. Penn State alumnus and Buffalo Sabres owner Terry Pegula spoke at the press conference, citing the university’s hockey team as an example of tremendous success in just five years.